Accepting the award on behalf of the Trenton Rotary Club (from left to right): Suzette Price, R.J. Lewis, Bill Sheehy, Bill Cleave (president), Rick Lazarick, Chris Secrist, Robert V. Ryan. On June 2, 2018, the Trenton War Memorial was filled with love and goodwill. 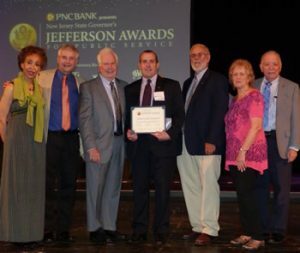 The Rotary Club of Trenton was an honoree for the Jefferson Award. “It is the oldest and most prestigious recognition program for volunteer/public service, and are the official recognition program of the United States Senate. The New Jersey State Governor’s Jefferson Awards administer that recognition program for New Jersey and are also the official recognition of the Governor’s Council on Volunteerism. There were multiple winners in 22 separate categories among several hundred nominees. Our category was “Service to Youth”. President Bill Cleave was the nominator and accepted the Award. The two Club Youth programs that were noteworthy include: First, we organized a “College Night” at Rider University with multiple speakers and educational sponsors. We informed hundreds of high school students how to navigate the application process and Financial Aid Programs. The entire Club contributed to its great success. Secondly, the Trenton Club was instrumental in supporting the 39 athletes who ran for the benefit of the Boys & Girls Club of Trenton. Event organizers Bill Sheehy and RJ Lewis ran the Trenton Half Marathon (13.1 miles) along with Crystal Bacon. Four other members, Bill Cleave, Mike Tusay Jr., Nick Tusay and Yuriko Bullock ran the 5K (3.1 miles). In total, our Club, the Princeton Corridor Rotary Club, and the Board of the B&G Club fielded 11 teams that raised $160,875. We established a Financial Literacy and Entrepreneurship Program. Rotary member, Dave Anderson, the CEO of the B&G Club will oversee the 5 year Educational Program beginning in September.